Brooklyn-based effect maker updates "most insane pedal of all time." Death by Audio has unveiled the Total Sonic Annihilation 2, an update on their first-ever pedal. The original Total Sonic Annihilation, which the Brooklyn-based company conceived as “the most insane pedal of all time,” functioned by feeding the other pedals in a chain through its effect loop and then back into themselves, creating wild and often abrasive feedback sounds. 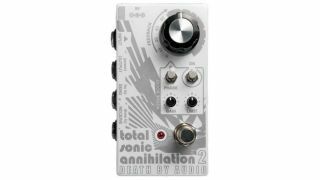 The Total Sonic Annihilation 2 is selling for $250. For more information or to purchase, head over to DeathByAudio.com.